George Clausen painter and etcher, born in London, the son of a decorative artist. From 1867 to 1873, he attended the design classes at the South Kensington Schools in London with great success. He visited Holland and Belgium in 1876, exhibiting his first picture at the Royal Academy in the same year. He continued his studies and worked in the studios of Edwin Long R.A. and subsequently in Paris under Bouguereau and Robert-Floury, later returning to London. Strongly influenced by the naturalism of the painter Jules Bastien-Lepage, he worked out doors and became one of the foremost modern painters of landscape and of peasant life. In 1895 he was elected an Associate of the Royal Academy, and a full Academician in 1906. Clausen was a founder member of the NEAC (New English Art Club) in 1886 but ceased to exhibit there when he had been elected A.R.A. in 1885. He became Professor of Painting at the Royal Academy. Aside from experimenting with etching and drypoint, George Clausen made a number of lithographs for the master printer, Frederick Goulding. Goulding , printed Whistler’s lithographs. In a letter of 1923, Clausen recalled that Goulding had been trying to revive the art of lithography and had asked a number of artists, including Clausen, to make drawings on specially prepared paper which were then transferred to lithographic stones. Lithographs produced using this transfer method, create an image which has all of the natural quality of a wax crayon drawing. The Senefelder Club was established in 1908 and held its first exhibition in 1910. The three founding members were F.E Jackson, Archibald Standish Hartrick and James Kerr-Lawson with Joseph Pennnell and John Copley joining later. Many European and American artists, such as Bellows, Matisse, Bonnard and Toorop, exhibited with the club during its early years. Clausen was appointed an official war artist in 1917. As an older artist he did not go to the Front line, instead recording activities on the home front. During the war his daughter’s fiancé was killed. The lithograph that we have for sale is part of the Series ‘The Great War: Britain’s Efforts and Ideals’. There were sixty-six prints were produced by the British government in 1917 as artistic propaganda with the aim of encouraging a war-weary public and raising support for the war effort.Eighteen artists contributed to the series, including Augustus John, Nevinson, Kennington, Muirhead Bone, George Clausen and Frank Brangwyn – some of the most celebrated artists of the time.As a government commission, the artists did not have full artistic freedom. They were given their subjects and each image had to pass censorship regulations. The prints are divided into two sets of portfolios, ‘Ideals’ and ‘Efforts’. The ‘Ideals’ address the question of why Britain was at war and what it aimed to achieve. These images are dramatic and symbolic, such as The Freedom of the Seas and The Triumph of Democracy. The ‘Efforts’ illustrate some of the activities of the war effort, the means by which Britain was to achieve the ‘Ideals’. The Efforts are separated into nine subject headings, each depicting a different activity or theme. These prints were commissioned by Wellington House, a government department secretly set up to produce propaganda. The project was managed by the artist Thomas Derrick (1885–1954), and the printing carried out under the direction of the artist and contributor F. Ernest Jackson (1872-1945). The printer was Avenue Press, London. The contributing artists were paid well, each receiving £210 (about £10,000 today) with the possibility of further royalties from sales. The prints were a limited edition of two hundred. The ‘Efforts’ were sold for £2 2s 0d (£100) each and the ‘Ideals’ for £10 10s 0d (£500).The type of paper used for the prints were watermarked ‘HOLBEIN’ and was made by Spalding and Hodge, a paper merchant and manufacturer whose paper mills were located in Kent. 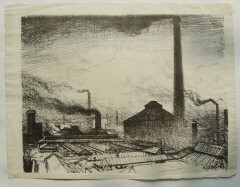 Many of the contributing artists were members of the Senefelder club, a small (Information from: National Museum of Wales)club set up in 1908 to encourage and revive artistic lithography. It was named after the 18th century German inventor of the process. This portfolio was produced at a time of a revival of interest in the artistic opportunities of lithography. The series was first exhibited at the Fine Art Society, London in July 1917, followed by regional art galleries around Britain. It was also shown in France and in America, where the majority of the portfolios were sent to be exhibited and sold.